America's national parks protect some of the country's most beautiful natural settings, including the unique beauty you will only find at Saguaro National Park in Arizona. Saguaro National Park is named after the giant species of cactus it was originally established to protect. It is now one of the largest preserves in the United States for this iconic symbol of the American west. It is split into two separate regions -- called districts -- on either side of Tucson, Arizona. Each district is on the outskirts of town, making this an easy park to access from a major metropolitan area. Kristi and Ray from San Francisco joined Greg on this trip. This was their first trip to the desert. "We were so excited to come to the desert. We have never been to the desert. Our go-to place is Yosemite. We visit it four times a year. And, we were so excited to be in this new environment -- just to do something totally different from that lush greenery and that dramatic landscape. This is dramatic as well but in such a different way," said Kristi. They started their trip off by going on a short hike on the Valley View trailhead, which isn't far from the visitors' center. Usually Greg likes to get off the trail and explore on his own but the desert can be a dangerous place with the large variety of cacti. The giant Saguaro Cactus that the park is named after are truly amazing. They can grow up to 60 feet and live for a long time. The arms on a Saguaro Cactus will take about 75 years to grow. They help the plant reproduce and soak up rain water. It is impressive that these plants can grow so large in a place so dry and extreme. There are a number of other plants that have adapted to the harsh desert conditions. A result of that adaptation is that most of them have thrones, needles, spines or other defensive weaponry designed to protect it against attack. One of the most mean-spirited of them is the Jumping Cholla Cactus. Signal Hill looks over the western valleys of Saguaro National Park and preserves a large amount of rock art called Petroglyphs. The shapes in the rocks were pecked by the Hohokam people more than a thousand years ago. For Kristi and Ray this trip to the desert was eye opening but dealing with tough conditions is nothing new for them. Several years ago, Kristi was diagnosed with stage three breast cancer. "When I found out my wife was diagnosed with breast cancer, it was really shocking. I remember leaving the doctor's office and getting in the car and driving home and all these thoughts are running through my head. Kristi almost had to tell me which way to go to get home. I always assumed that I was going to be the one to go first. Something happening to her, I never thought about that," said Ray. Kristi's battle with cancer was rough. The chemo and radiation treatments took a toll on her body. Having never been the type of people to explore the outdoors, Kristi's cancer put them on a path to nature that would lead to a new world of discovery. "After all the chemo and radiation and multiple surgeries my husband, my daughters and my dad knew that they had to get me out so I could look forward to something, so I could get well," said Kristi. On their second day of the trip, they headed to the Rincon Mountain District. This part of the park is expansive but offers a great loop drive with plenty of trails to hike and explore. Later in the day, they hiked to a lofty perch near Gates Pass Road Overlook in hopes of viewing a sunset of a lifetime. But on the decent, Greg got a painful reminder of the respect and caution that is required to safely explore the rugged Sonoran landscape. A large Jumping Cholla Cactus attached to his leg. Click here to watch the clip. After exploring the park, Greg, Kristi and Ray stayed at Loews Ventana Canyon Resort. Intentionally built to blend in with the desert surroundings, the resort offers beautiful views, comfortable rooms, and wonderful dining options. The Valley View trail proves to be the perfect way to begin exploring what the park has to offer. Then a short walk to Signal Hill is a great way to look into the past and observe art created by the ancient people who once called this desert home. On day two it was time to see what the other side of Saguaro National Park had in store. Driving the Cactus Forest Loop Drive was a great way to cover this area and to scout for a place to get out of the car and do some exploring off trail. Then Greg, Ray, and Kristi head back to the west hoping to catch one of Saguaro's epic sunsets. The group hikes to a lofty perch near Gates Pass Road Overlook in hopes of viewing a sunset of a lifetime. Near dark, and on the decent, Greg gets a painful reminder of the respect and caution that is required to safely explore the rugged Sonoran landscape. If coming back to a comfortable place after a long day of exploration in the outdoors is important, then the Loews Ventana Canyon Resort is the perfect choice. Intentionally built to blend in with the desert surroundings, Loews offers beautiful views, comfortable rooms, and wonderful dining options, all right on site. Greg has a painful encounter with a Jumping Cholla cactus in Saguaro National Park, Arizona. The desert heat gets to Greg and two guest hikers after they explore southern Arizona's unique Saguaro National Park. 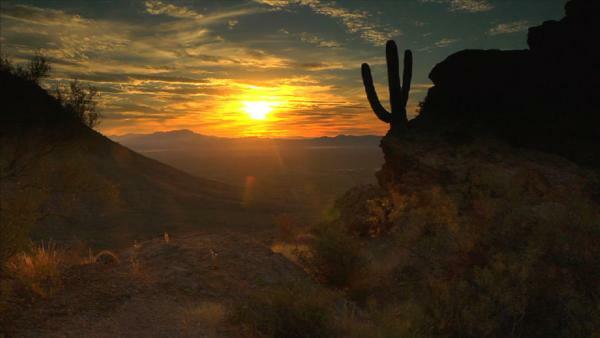 The Motion crew captures the beauty of Saguaro National Park.